The “Dulles Baby Announcement” is a beautiful keepsake for your family and friends that they can frame. On thick and/or elegantly textured stock, with expert pre-press photo services and the best photo reproduction or joyful artwork and graphics, the “Dulles Baby Announcement” is inimitable and of superior production quality. 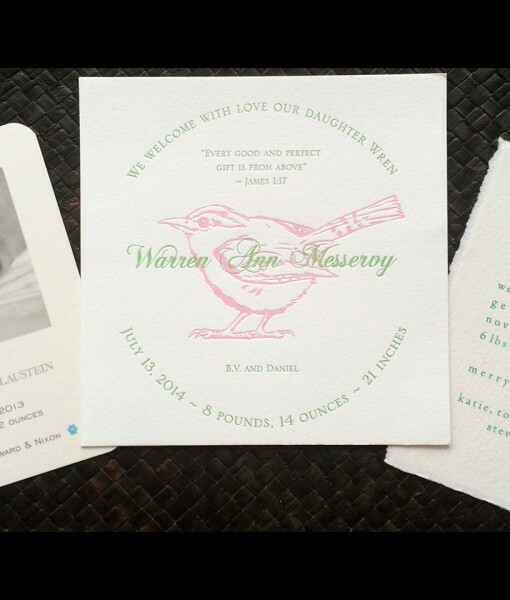 We never add our brand or website to your “Dulles Baby Announcement” (unlike those low-cost printing companies) – we let your family shine! Emilie will walk you through the photo selection and design process, step by step, with ease and zero stress – either before or after your baby joins your family. Smartphone photos of high resolution are often acceptable for high quality printing, yet professionally captured images are recommended for the most beautiful printed projects. Addressing and mailing services are also available so you can focus on your bundle of joy!